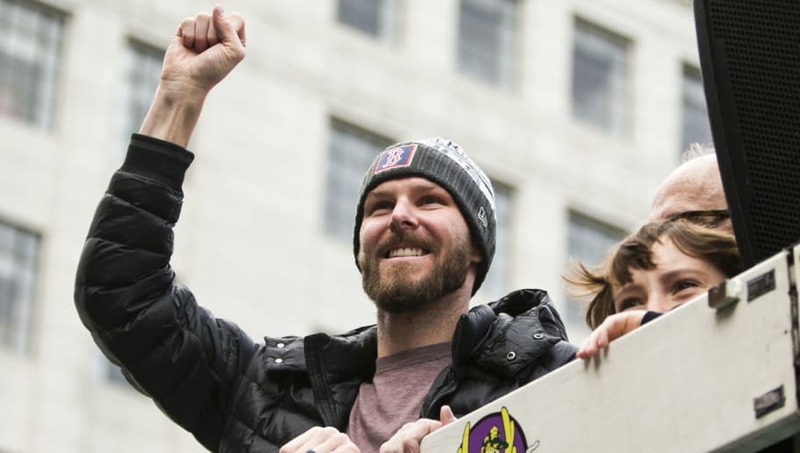 ​​Chris Sale is going to be sticking around in Boston for a long time, as he and the ​Red Sox have officially reached an agreement on a five-year contract extension. The details of Sale's deal have been revealed piece by piece, and he's set to make an absolute ton of dough. ​Sale's contract is for five seasons but includes both an opt-out after the third season and a sixth-year option worth $20 million, according to ESPN's Jeff Passan. Sale is due to make $30 million each year for the first three seasons, followed by two years at $27.5 million per annum. The breakdown of Chris Sale’s five-year, $145M extension front-loads the money. Year-by-year: $30M, $30M, $30M, $27.5M, $27.5M. It’s has the highest AAV for an extension and has escalators from 2021-24 and in the vesting option based on Cy Young finishes. Sale's deal has the highest annual average value ($26.7 million) for a contract extension and features escalators from 2021-24 that could see him earn even more money. Ken Rosenthal of The Athletic reported that the Red Sox are expected to announce his deal as a six-year, $160 million deal in order to reduce his AAV and lower their payroll to keep them out of the luxury tax. The extension will see Sale pocket more than $200 million in career earnings. #RedSox expected to announce Sale deal as six years, $160M, including this year’s $15M salary and lowering AAV to $26.7M, which will help with luxury-tax payroll. With extension, Sale will top $200M in career earnings. Sale is certainly deserving of the ​massive extension, as the lefty has been sensational since joining the Red Sox as part of the ​Yoan Moncada trade ahead of the 2017 campaign. In two seasons in Boston, Sale has a record of 29-12 with a 2.56 ERA, 0.92 WHIP, 545 strikeouts and 372.1 innings pitched across 59 starts.